The global household cleaners market demonstrates a largely consolidated vendor landscape, wherein top three companies held more than 49% of the market in 2015, reveals a recent market study by Transparency Market Research (TMR). The top three names in the household cleaners market, namely S.C. Johnson & Son Inc., Procter & Gamble Co., and Reckitt Benckiser Group plc display a strong foothold in the overall market. These companies have consolidated their position by means of vast global presence, continuous production innovation, and extensive product portfolio. Top-notch players in the household cleaners market are largely focused on geographical expansion. A case in point is Henkel Company AG & KGaA. In May 2015, the company acquired Colgate-Palmolive’s complete range of detergents and pre-wash products in Australia and New Zealand. 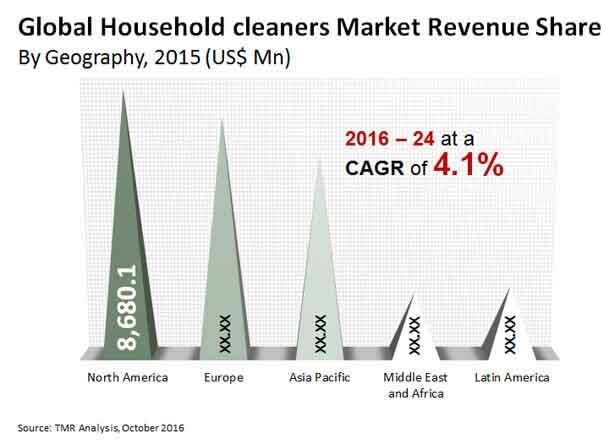 As per the TMR report, the global household cleaners market is predicted to be valued at US$39,400.9 mn by 2024 from US$27,468.6 mn in 2015 at a CAGR of 4.1% therein. Product-wise, specialty cleaners held the leading 60% market share in 2015. On the basis of geography, North America stood at the fore in the global market in 2015. However, in the coming years, Asia Pacific is predicted to surpass in terms of market share. First and foremost, rising awareness of importance of clean living spaces is mainly driving the household cleaners market. Household cleaners have become an essential commodity in urban homes to prevent breeding of germs. While household cleaners have long been used in developed countries, they are increasingly becoming an essential commodity in developing regions. Rapid urbanization, changing lifestyle, and rising purchasing power in developing regions are contributing to the growth of household cleaners market. Apart from this, introduction of newer products such as fabric refreshers and surface deodorizers is also serving to boost this market. Newer products such as surface deodorizers and fabric refreshers find extensive use for commercial applications such as in the hospitality industry. Flourishing hospitality industry is serving to boost the worldwide demand for household cleaners. On the other hand, availability of cheaper substitutes is hampering demand especially in cost-sensitive markets. Consumers in these regions tend to opt for locally manufactured cheaper substitutes over global brands. In regional markets, domestic players have a considerably strong foothold and display hold on supply chains. The price point of household cleaners manufactured by domestic players is a big threat to many global brands. In addition, the household cleaners market also face the brunt of common conception of containing toxic compositions that could cause skin diseases. The impact has been witnessed in the form of continuously dwindling sales of cleaning agents such as surface disinfectants and bleaches, which do need to be carefully handled owing to high toxic chemical compositions. In the interest of consumer safety, due to this reason, the use of certain bleaches and specialty cleaners is restricted worldwide.